On May 15th Merched Chwarel met to walk to Rhiw Bach quarry in Cwm Teigl, Bro Ffestiniog. The intention of the day was to begin making the banner for the Procession in Cardiff , which we did ! (see blog May 27th). Being there all day meant that I had absorbed the atmosphere of the location in a peripheral way, whist working on the banner, in a softer focus.the whole day felt almost like a dream. Back in the studio later, having managed to get hold of some photocopied maps of Chwarel Rhiw Bach 1876 and 1913, I decided to continue my series of Quarry Maps while I was still captivated by the atmosphere of the day. Having researched Rhiw Bach quarry village for our R&D phase, with a particular focus on the quarry school that was set up by Kate Hughes,(later Griffiths), my first layered map incorporates the 1913 map reference to the quarry school opened in 1909 and its geographical location within the steep contours of the landscape. For images ref The Mapping Room. This map series will continue. Y Ddresel Griddfan was our next collaborative project (see website) which is ongoing. Within my own working practice and as a form of exploration of the subject of the dresser, I thought of my childhood experience in South Wales growing up with ‘The Seld” (as its called in the south) as pride of place in the parlour. My main fascination was that the inside of the dresser had been wallpapered by mamgu. I took great pains to remove layers of this paper when I inherited it but remember the process well. 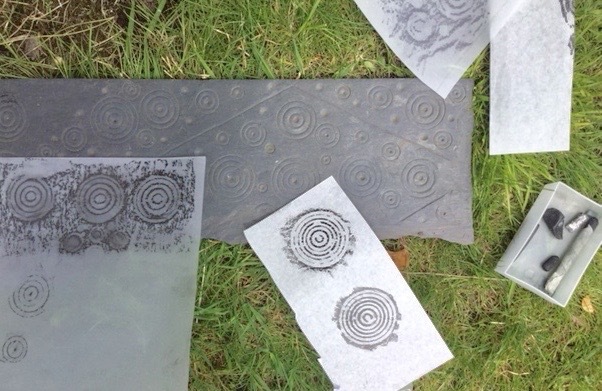 I decided to make a small ‘fragment’ of a Dresel ( an explosive fragment of the main Ddresel Griddfan ) wallpapered with rubbings in both wax and slate dust from the slate concentric circle slate patterns made by the quarry men of Blaenau Ffestiniog. These were made during the period 1823-43 and the men who carved them invented their own tools and developed their own styles. I explored reproducing the slate pattern in reverse by embedding a layer of clay into the pattern thus creating a positive imprint and fired them in a small sawdust kiln.These ‘fragments’ made from a soft material (clay) and hardened by fire, is included as a metaphor for the interrelationship of man and woman within quarry life, the soft and the hard materials and the metamorphosis of one into another. No dresser was complete with out the symmetrical Staffordshire ceramic dogs, which I have included here in reduced scale.Their presence in all the family houses unnerved me as a child and I ended up hating their presence. Why are they in a small cast lead boat? ..a child hood reference to one of my favourite poems by Edward Lear “The Owl and the Pussycat”…..small boats are an obsession of mine and are within the context of the slate transportation……being lead, I hope the dogs will sink! When Merched Chwarel were working on our collaborative Ddresel Griddfan, a small cupboard had been placed on a small trolley with wheels and we all identified it as a ‘Ddresel Gwyllt’, paying homage to the ‘car gwyllt’ used as a means of transport by the quarry men of Blaenau. We also referenced the work of Jean Tinguely, especially his ‘Homage to New York ‘ which was partially self destructed at Moma New York Sculpture garden in 1960.Included in the pieces that didn’t destruct was the ‘Suicide Chariot’, a small work on wheels . He has included these small chariots in a number of his ‘metamatics’ ever since ,e.g. ‘Machine Spectacle” and this inspired me to use the wheels and wooden mallet found in Jill’s fathers shed to make ‘Y Ddresel Gwyllt/The Wild Dresser’…escaping from the main piece.there may be more. Some of these are so small they need a magnifying glass to see the detail .This action takes us in more closely into these intimate spaces almost like a peep hole context. My main work throughout the past few weeks has been “Y Cwrlyd Llechen / The Slate Quilt’ which is in its early stages of experimentation and much practise cutting slate with a French Scissors.